The Raven and the Reindeer is a retelling of Han Christian Anderson’s “The Snow Queen” that’s full of Ursula Vernon’s quintessential charm. 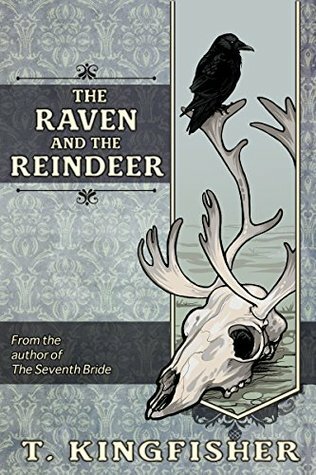 T. Kingfisher is the name she uses for her adult work, but I think The Raven and the Reindeer could be an easy YA crossover. The arc of the story hews close to the original. Greta’s friend Kay is taken (or chooses to go with?) the Snow Queen, and Greta sets off to rescue him. In this version, she has the aid of a talking raven and, eventually, a robber girl, who quickly becomes her love interest. That’s right, this is a queer retelling! From the beginning, it’s clear to everyone but Greta that Kay isn’t that great. He doesn’t seem to care about her or see her as his friend, and he just assumes she’ll be there when its convenient for him. He certainly wouldn’t bother to rescue her if their positions were switched. But while the goal of her quest (saving Kay), might not be one I care much about, it’s easy to root for Greta for other reasons. In the process of making her journey, she comes into her own, growing in strength and confidence. I might have liked for her to have more of a realization that Kay’s a jerk, but I think she mostly had it figured out by the end. In the first sentence of my review, I described this book as full of charm. And that really is the perfect word: charming! The dialogue is snappy, the protagonists are endearing, and the talking animals are simply wonderful. It mixes in the lightness of humorous moments and Greta’s newfound romance with darker elements of the Snow Queen who hurts others just because she can. The Raven and the Reindeer is also fairly short, at around 200 pages. Maybe it’s a normal length for a novel and I’m just used to longer. I did appreciate the quick read though! I recommend The Raven and the Reindeer to anyone who likes fairy-tale retellings or f/f stories with a happy ending! Ooh, I gotta get this!! To date I’ve only read short fiction by Ursula Vernon (in either of her incarnations), and I keep meaning to ask my library to order some of her books. I love what she does; her creepy fairy tale thing is SO my aesthetic. Yes! It seems like she doesn’t have a ton of longer fiction, but I want to read what she does have. …I really need to read some of Ursula Vernon’s long-form. I adore her Grandma Harken stories but somehow haven’t got round to picking up a book yet. There’s just so many books, too little time!